I make player comparisons by style of players along a spectrum of talent. The mid-range of that talent spectrum for Georgia RB Todd Gurley would be Cedric Benson. The upper range? Larry Johnson. Photo by Dusty Werner. Todd Gurley’s style reminds me of Penn State star Larry Johnson. For those of you who remember Johnson for his exploits with the Chiefs than the headlines he made off the field, it’s weighty praise. What they have in common is the agility of a 210-pound runner in the powerful frame of 225-230 lb. back. It’s incredibly difficult to boil down any player with just one play. Yet, if I need a play to add to the highlight reel that will help a team make a decision where to slot Todd Gurley on its board, this is my nomination despite the fact there’s an impressive display of long speed on a 75-yard touchdown earlier in this Clemson game. There are several things about this run that underscore Gurley’s physical talent and conceptual skill. The first is ball security. Gurley is a primarily a power runner and to do work between the tackles at a high volume a power runner better hold onto the football. You’re going to see throughout this unusual run that he keeps the ball high and tight to his body. There are points during this run where his elbow comes loose from his side, but considering what he has to do during this 12-yard touchdown run his ball security is praiseworthy. Gurley has the ball tucked to his left side on a run to the left. Even when he has stop short of his path outside the initial block and make a sharp bounce to the inside the ball doesn’t swing loose from his chest. This is one of the most common errors of ball security I see with running backs. They can execute incredible displays of agility and balance, but the ball-carrying arm flies loose of the body and the passing traffic may not tackle the ball carrier, but they can force a fumble. A good stiff arm or straight-arm isn’t just for attacking defenders or avoiding a wrap-up. Gurley uses his free arm to work around bodies in space. He places his arm on the back of the lineman to stabilize his change of direction and prevent a collision with his teammate. One of the more impressive parts of this run is Gurley’s feet. For a big back with long speed, he also has some excellent short area quickness. Watch him stutter his steps to slow his path to the outside, keep his balance after establishing contact with the blocker, and then plant with both feet to bounce the run inside. This is a great on-field example of balance and agility. As Gurley exits the hole, the ball remains high to his chest. While the elbow could be tighter, the runner’s ball security is good enough to avoid the rip attempt by the Clemson defender. If you look close enough you can actually see Gurley squeezing the ball tighter as No.11’s arm reaches towards the ball. From the point Gurley declares a path at the line of scrimmage until he reaches the end zone, his pad level is excellent. I also like how high his knees are as he approaches the defender he’s about to stiff arm. Note that he makes first contact with the oncoming defender and at the same time squeezes the ball high and tight. Once the defender makes contact with Gurley’s body, the Georgia runner begins to drive through it with even lower pad level. Whether it’s a sharp cut, a change of direction, a stiff arm, or running through a defender’s wrap, Gurley’s ball security is high and tight. For a back with his strength and home run-hitting skill, it would be easy for him to run with greater abandon. The fact that he doesn’t will endear him to coaches if he can continue to display this good habit in the NFL. These characteristics don’t guarantee that Gurley will be a star as a professional. 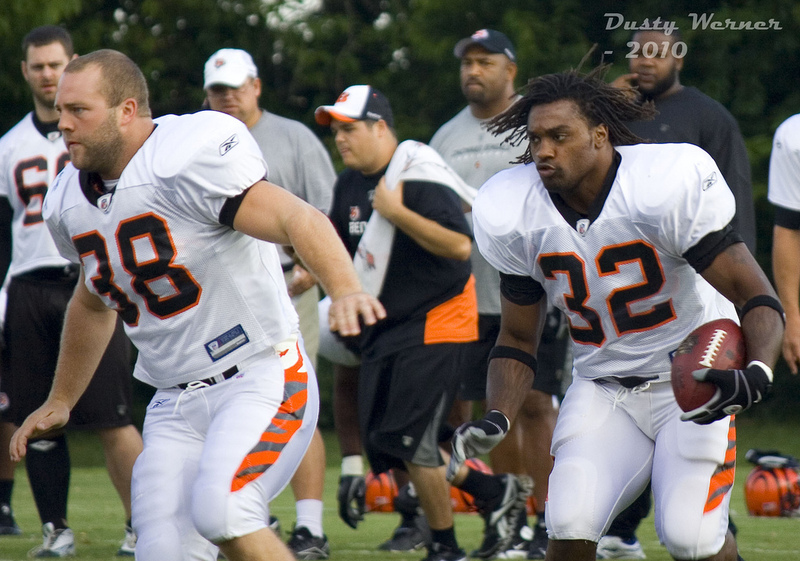 Cedric Benson had excellent agility and footwork and true power. He had years with good production, but he would never be considered an upper echelon runner. Everyone loves Trent Richardson’s potential and while he has displayed that he is one of the more exciting young talents at the position, but he hasn’t proven he’s one of the better backs in the NFL. What this play demonstrates is that Gurley has the skills to earn a grade within the realm of Benson and Richardson’s draft scores. The difference is that the value of running back has changed enough that there’s a 50-50 chance Gurley doesn’t find a team until the second round. You can ask draftniks more about that possibility. I’m not trying to be a junior GM from my home office – I have too many players to study for playing dress-up. You can begin placing orders for the 2015 RSP in January. I loooove me some Gurley, but as with most players anymore landing spot is going to be so, so important for him, as to how much of an impact player he becomes at the next level. Gurley’s been a great collegiate player, and he should be able to become productive in the NFL too, but I don’t see him as “transcendent level”, as far as his talent goes. I honestly never felt that way about Richardson either. I certainly didn’t about Benson. That really isn’t a slam though, in my mind, since I think over the past 10-15 years there has been only a handful of guys at any position in the NCAA that were talented enough to overcome even horrid situations once they turned pro. Hell, if I were being forced to name guys on offense over that time period there may be exactly one on the list for me: Peterson. Even studs like Calvin Johnson had questions(due mostly to route tree in his case) and QBs can be ticklish business in the best of cases. That said, if he goes to a prime location with an offense that fits his talents well, or to a staff that will tailor the rush offense to take advantage of his strengths? He could go absolutely nuts. The guy just knows how to run the football. Angles, vision, etc. When guys his size have the vision he does it usually = a lot of good things for his team.